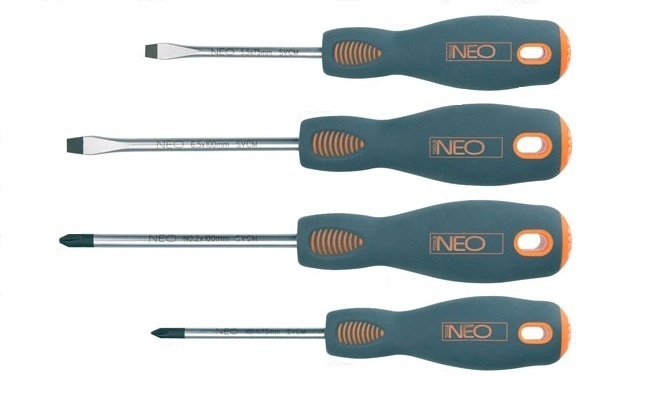 NEO screwdriver set includes 4 screwdrivers: cross and flat slotted. Screwdriver shank is made of exceptionally durable chromium molybdenum steel. Screwdriver blades are heat-treated to obtain suitable resistance to bending and hardness 56 HRC. Screwdriver has magnetic tip. Tri-lobular handle shape with profiled thumb rest reduces hand effort during work and facilitates getting the right torque. Two material handle prevents from slipping in hand, it is also resistant to chemicals, oils and greases. Tool quality confirmed with TÜV certificate and 25 years manufacturer’s warranty. NEO brand meets expectations of professionals.